We enjoyed our idyllic escape to the treehouse in the redwood forest and by losing ourselves in the endless expanse of shimmering blue sea. 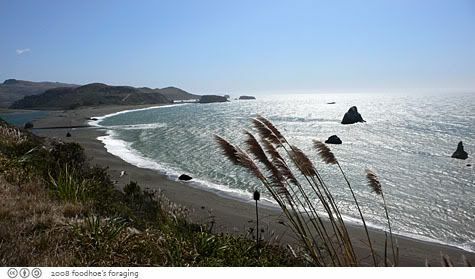 No newspapers or television to mar our getaway with the grim goings on in the world… This morning we explored further north on the Sonoma coast and pulled over at Fort Ross after I began to feel queasy from the winding switchback roads that looked like the set for a car commmercial. It felt good to put my feet on solid ground for a while. 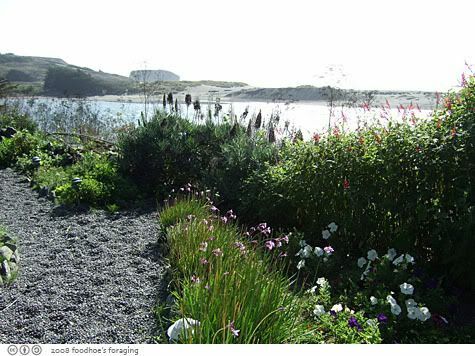 The grounds were protected from the buffeting winds and we enjoyed the warm sun and spectacular views. 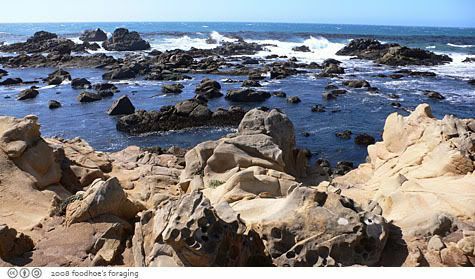 Our destination was Salt Point State Park which has gnarled sandstone formations called Tafoni, an Italian word that describes the fantastic honeycomb patterns created by cavernous weathering. 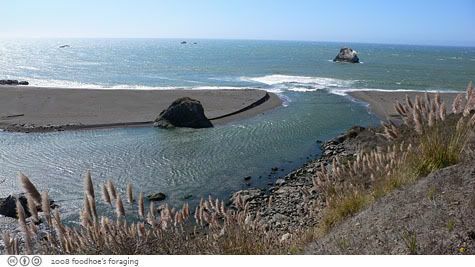 These form a surreal playground to explore and provide excellent nooks and crannies for tidepool fanatics. Unfortunately the tide was too high and the winds shrieked in our ears and howled after us, chasing us back into the car… on our way back for a highly anticipated lunch. 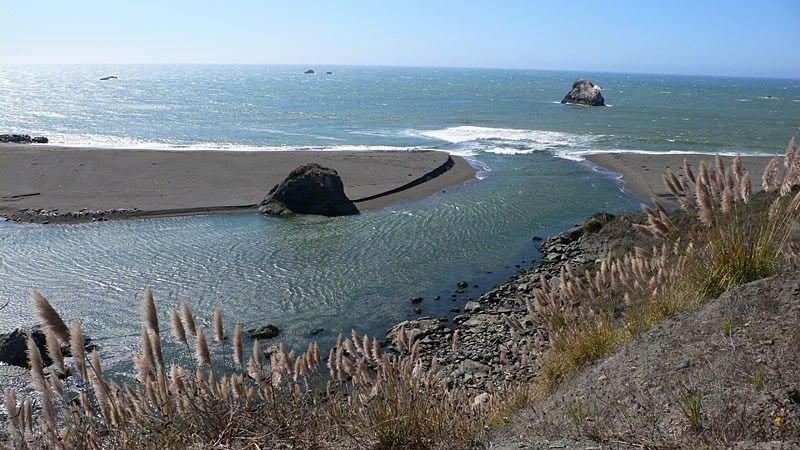 We drove down to Jenner by the sea, which is a cozy town overlooking the estuary where the Russian River flows into the Pacific. 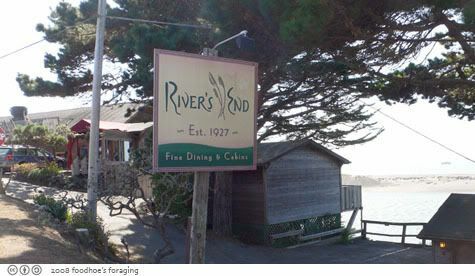 There are some lodges and vacation rentals and the River’s End which offers both oceanview cabins and a very fine spot to eat a delicious meal. 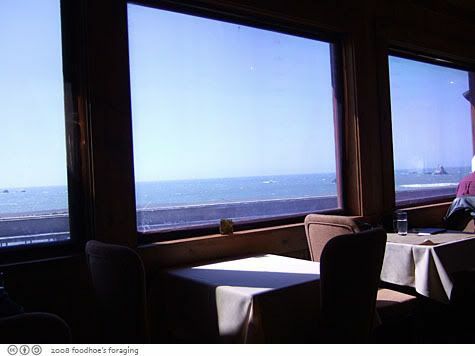 The restaurant sits on a ridge and offers dramatic views from every table where you can watch miles of waves rolling into shore, sea lions napping in the sun and pelicans diving headfirst into the water to catch a snack. Since we were on the coast, we had to order the fresh oysters of the day. 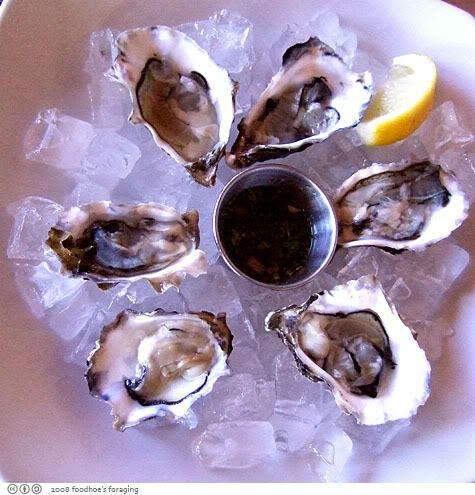 Here are our Six Oysters on the half shell ($16) Miyagi oysters from up north. These were served with the most delicious Ginger-lime mignonette sauce, that was bright and zesty with bits of shallot and fragrant cilantro. The Miyagi’s were larger than the kumamoto oysters we had been enjoying. 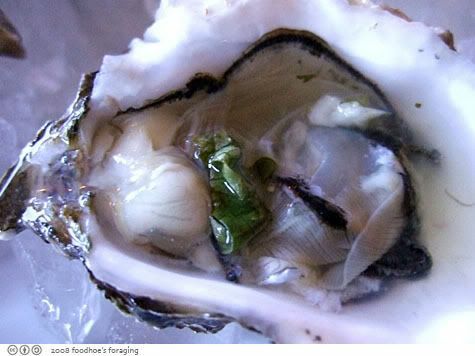 The flesh was firm and sweet tasting not creamy but very clean and briney like the sea evaporating in your mouth. 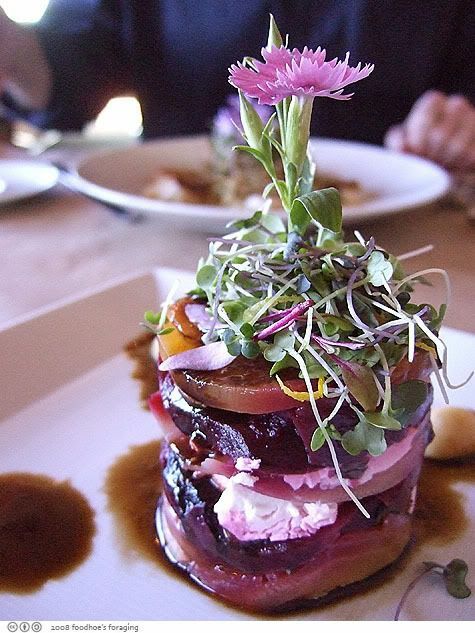 I was attracted to the description of the Technicolor Beet Salad ($14) which was a tall construct of roasted multicolored beets layered with mascarpone and goat cheese macadamia nuts and basil drizzled with orange balsamic vinaigrette. It was served straight out of the refrigerator which seemed to dull my tastebuds as well as the flavors of the cheese. It was all right, but tasted like a pile of beets. Everything sounded so bright and shiny but the dish failed to deliver any excitement to our eager tastebuds. 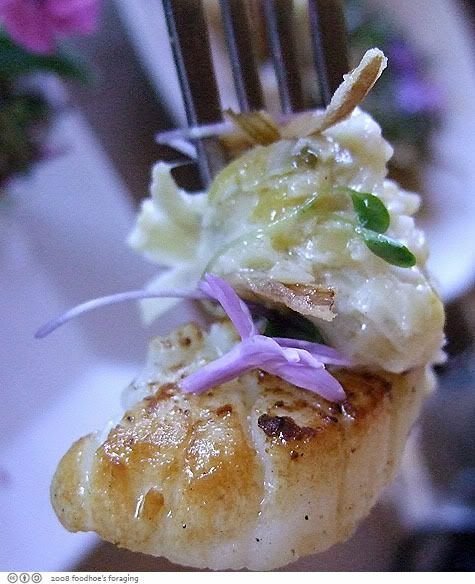 We shared another appetizer of Scallops and Leeks ($19) which were pan seared scallops on a creamy bed of leeks served with vanilla bean oil finished with a touch of crispy fried leeks. Hmmmmm, the vanilla was an amazing accent, you can see the black specks from the vanilla beans. 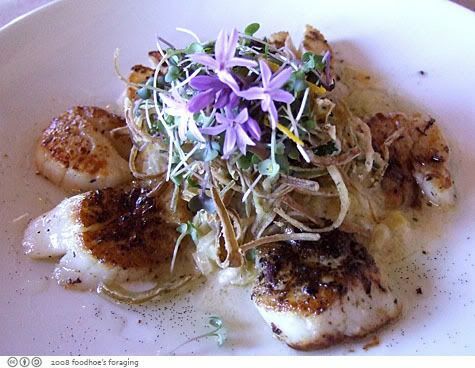 The sweet succulent scallops were luscious with the rich creamy leeks and the crunchy fried leeks added brilliant bursts of flavor and texture. We were captivated by the addictive aroma of vanilla that wove in and out of each bite. This was Mr. K’s favorite. This was topped with a beautiful purple flower that our server assured us was edible and tasted like garlic. 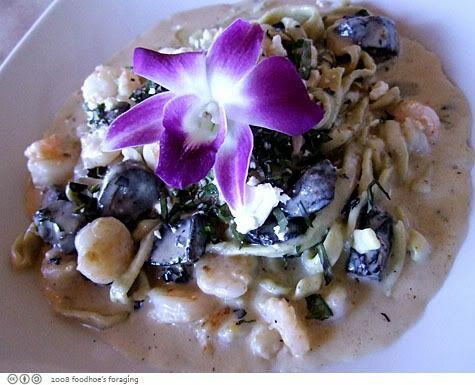 Wild Shrimp and Pasta ($28) piled with small plump white shrimp, chunks of meaty portabella mushrooms, smoked overnight tomatoes, and feta cheese spooned over fresh herb pasta finished with black truffle cream sauce. My confidence was restored in creamy pasta sauces after the unfortunate pasta from the day before. The overnight tomatoes were a delight, they were similar to sundried tomatoes but less aggressive, adding bright bursts of chewy tomato flavored with garlic and herbs. The fresh pasta was supple and velvety on the outside but had a very good firm texture and the dish was rich with the earthy aroma of truffles. Yum. 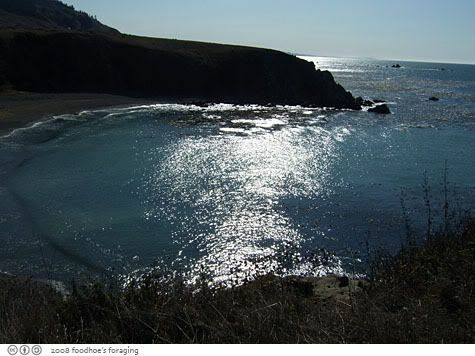 Chef Dahlquist, you made someone very happy and a peaceful calm was restored to the land…. Wow, what a great place to eat at the restaurant! the water’s edge is so beautiful! i can only imagine what it’d be like to see that all the time. rosa, it definitely was a good spot.